INTERESTED IN A SADDLE OR HAVE ANY QUESTIONS. rider! We will have more photos and information on our personal Duett saddles very soon. for your rear end! You really do forget about the saddle and are able to concentrate on your riding. tree" - webbed seat for rider comfort. ~Our popular Rondo model in a two tone brown. ~Available in 16", 17" and 18" seats--buy 18" if you normally ride in 17.5"
40 and 42 cms available! The Fidelio is a comfortable, beautiful saddle at an amazing price. We invite you to try it--you won't believe what we are offering! If we don't have the seat/tree you need in stock, we can order it for you. Seat sizes 17"-19", with trees from 32 to 42 cm. The Encore is the saddle that just "disappears under you." It's a saddle that gives great freedom to the rider. The Encore is available in: 17.5",18", 19" and now 20" seat in a wide variety of tree widths: 32, 34, 35, 36, 37 and 38 cm!! Made with high quality smooth leather on the flaps, nice, flexible and easy to break in. 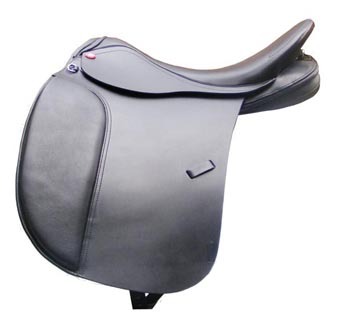 The saddle is designed so that when you remove the block, another piece of shaped leather covers the velcro area completely, keeping it free of horsehair, and the dust seat which is just a little flatter than the Aria seat, making the saddle somewhat less restrictive. As with other Duetts, you will feel immediately comfortable and at home with the Encore. Please note: the Largo model fits small due to the cutback. 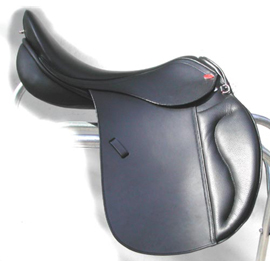 This saddle is currently available in a few 17" or 17.5" seats, in limited widths, in 18" and 19" seats in 34, 36, 38 and 40 cm widths, and in 20" in 34, 36 and 38 cm. The Largo is available in the very widest tree widths: 36, 38 and 40 cm. 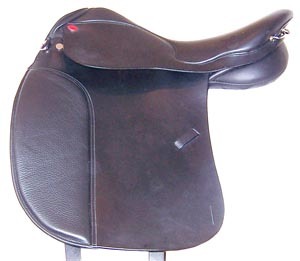 42 cm saddles are available by special order. smooth knee pads or nubuck. billeting system with two billets attached to the saddle tree in three locations is balanced and designed to stabilize the saddle; it is the same as the billeting system for the Encore saddle and similar to that of the Fidelio. Keepers on the bottom of the upper flap allow billets to be threaded through, which helps pull the flaps tight to the horse. Pretty, soft gray piping around the seat--subtle, but elegant! Coming in November: a few saddles will be available in 20" seats. 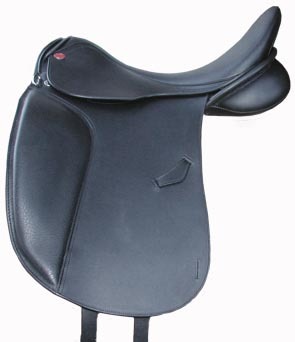 Semi-deep seat, well balanced and popular jump saddle fits horses with or without withers; banana knee roll, padded flap, square cantle, smooth leather, wool flocked. Boy, is this saddle comfortable! And unlike the flat-seated, foam flocked close contact type of saddle, this one is deep and comfy enough to be used for all purpose riding, too. You don't have to be up OUT of this saddle in order to tolerate riding in it! 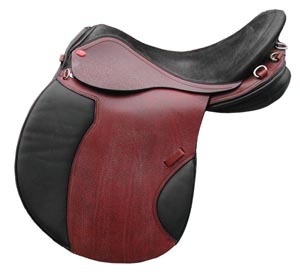 Because of it's deeper seat, it is a wonderful saddle for eventing and foxhunting--it'll keep you secure, but it has a moderately forward flap for taking the jumps. My daughter uses the 36 cm version of this saddle on our Haflinger and loves it! It's extremely comfortable and puts her in a great position for flatwork and jumping, as the flaps are not too forward. This saddle is available in a limited number of seat sizes (16.5", 17", 17.5" and 18") and a few tree widths (32, 34, 36 cm). We now have some 19" and even 20" seat Prestos! Our newest model for jumping is not quite as deep as the Presto model. It has a gently square cantle, removable knee blocks (note leather cover will protect velcro area from dirt when block is removed) and gusseted, wool flocked panels. We feel that our wool panels are an important feature, as they are easily adjustable. This saddle is offered in a wide variety of seat sizes, from 16.5 to 18, in widths from 32 (medium) to 38 (extra, extra wide). 16" or 19" seats and either narrow or wider tree widths available by special order with no extra charge. 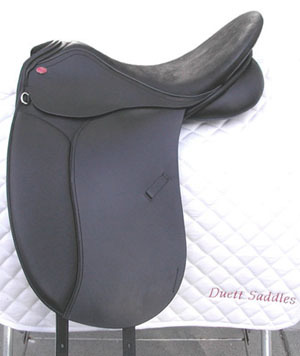 Trail & elite foxhunter saddle designed by and for DUETT! The COMPANION FOXHUNTER is a variation on the Companion trail model. This saddle is useful for trail riding, since it has the same comfortable padded seat, removable knee and calf blocks and the same tree and flap design. However, with short billets and two brass D rings on the right side of the seat, in a gorgeous, rich brown leather, it has the right look for foxhunters, or for trail riders who want a more traditional style. 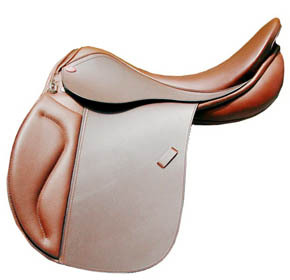 Trail saddle designed by and for DUETT! 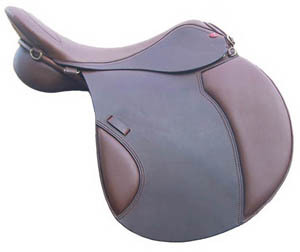 These are the features of this fantastically comfortable saddle which make it ideal for both pleasure trail riding and endurance riding: Lightly quilted, soft seat is comfortable for unlimited hours...Wide panels distribute the rider's weight over a large area....Note: These are wool flocked panels and as easy for fitters to adjust as Duett's other wool flocked panels! SPECIAL FEATURE: Removeable/moveable knee AND calf blocks give the utmost in flexibility to the rider! No fixed block! You can remove the blocks for closest contact, or you can move them back to support your leg differently, or you can change the angle! When you remove the blocks, there is a piece of shaped leather which you can attach to the velcro to keep it clean. Textured, grained brown leather on the flaps gives added grip and stability to your leg--it's durable, too! Available in 16", 17", 18", 19" and 20" seats (some in 17.5" also) with 32, 34, 36, 38 and 40 cm trees. NOTE: This saddle works well for Icelandics and other gaited horses. In addition, with the movable knee block, it's easy to move the block back towards your knee and keep a nice, straight leg. Or--take the big front block off and move the little block forward, allowing more room for your leg or for shorter stirrups. This model was designed with three types of riders in mind. First, it's for all of you call and say "I mostly trail ride but I also want to school and show low level dressage," for those who ride GAITED horses with a long leg, and for those who want the comfort of the Companion models with the ability to ride with a long leg. 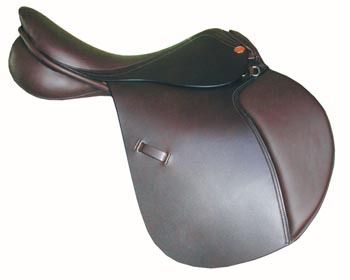 Note: this saddle is a hybrid of the COMPANION TRAIL--same padded seat and same wide, weight bearing panels--and a DRESSAGE, with a straighter flap and moveable block. 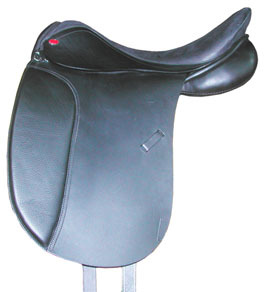 The flap is just a little bit wider and a little bit shorter than on our dressage models. It will give you and your horse the long-distance comfort of the Companion trail. We have only one sample in stock, and a few others have been sent to some of our tack shops. In January of 2008, we will be well supplied with a variety of seat and tree sizes. We have ordered the Tango with no back D rings or crupper attachment, so that the saddle can be used in the dressage ring. However, our fitter and repair person can add D rings for a small fee. Saddle designed for gaited horses which allows riders to optimize use of weight aid. 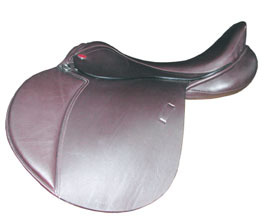 Note: this saddle does not have long panels and will not encourage pressure on the horse's loins. 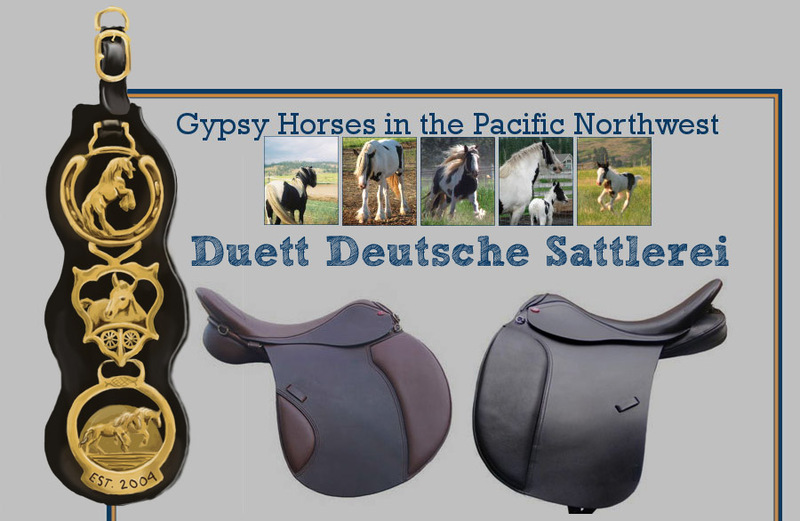 Comfort for the horse is primary, as in the design of all Duett saddles. This saddle also works well for riders who don't like a saddle that feels confining; the lower cantle/flatter seat can work well for riders with this preference. NOTE: The photos show this saddle with short billets. It will be available with long dressage billets only. SPECIAL FEATURE: Removeable/moveable knee blocks give the utmost in flexibility to the rider! No fixed block! You can remove the blocks for closest contact, or you can move them back to support your leg differently, or you can change the angle! When you remove the blocks, there is a piece of shaped leather which you can attach to the velcro to keep it clean.